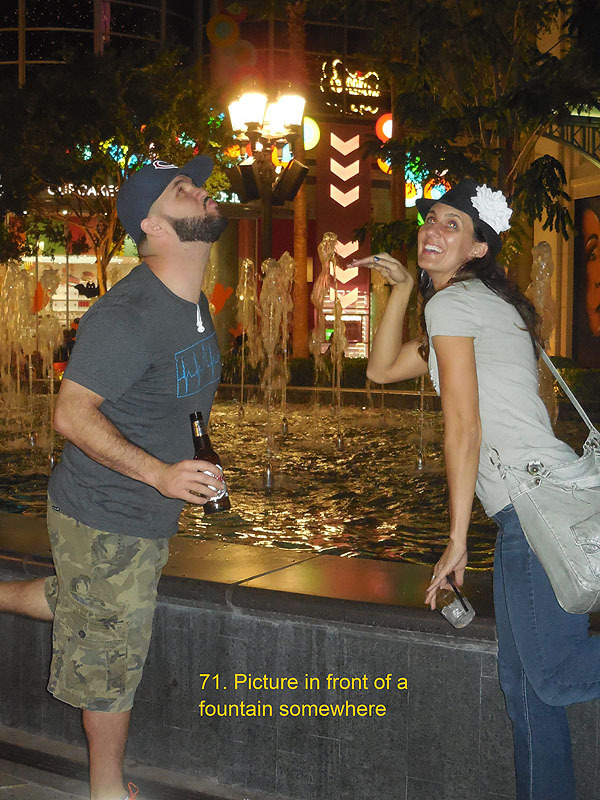 Last October, when my brother and I met my mom out in Las Vegas for a weekend visit, I told her she should make us a scavenger hunt like she used to do for our birthday parties when we were kids. She took me seriously! 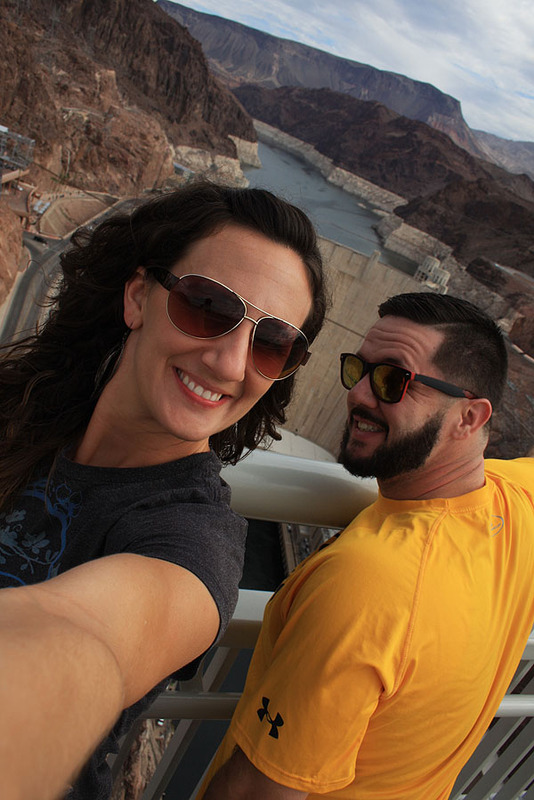 She compiled a list of 100 things for us to find (and photograph) while we were there -- most were general "Las Vegas" things, and some are specific to her world in Las Vegas. 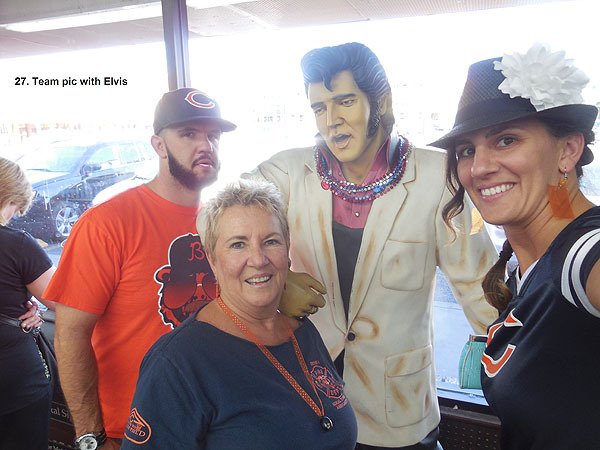 While we visited and took in some Las Vegas sights, the hunt made for a really fun theme throughout our weeked of silly things to look for. 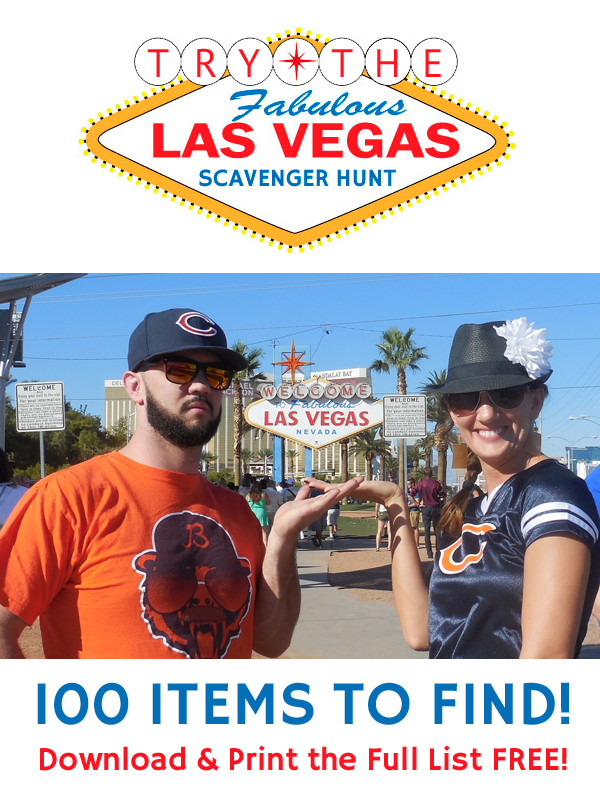 Since we had such a good time doing it, we wanted to share the list, a few of the photos we collected during our scavenger hunt, and offer a challenge for anyone else making a Las Vegas trip! This would be so much fun to do with a big group of people--or two groups, who could compete for the most points! 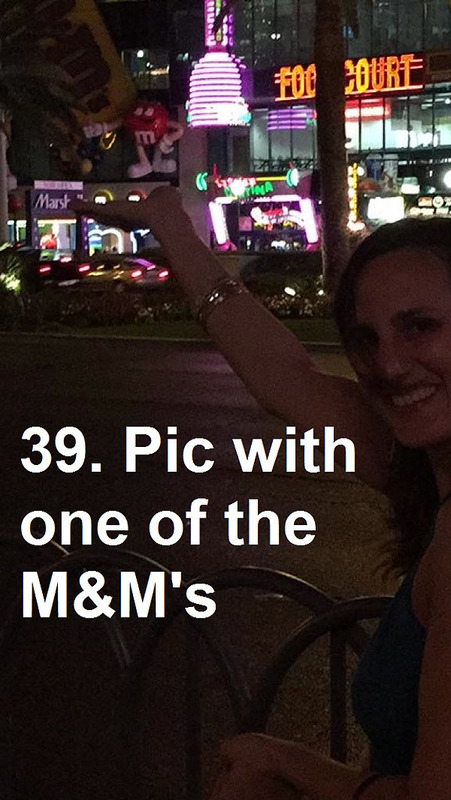 How many can YOU find in a weekend in Las Vegas? Sign with a "Z" in it. 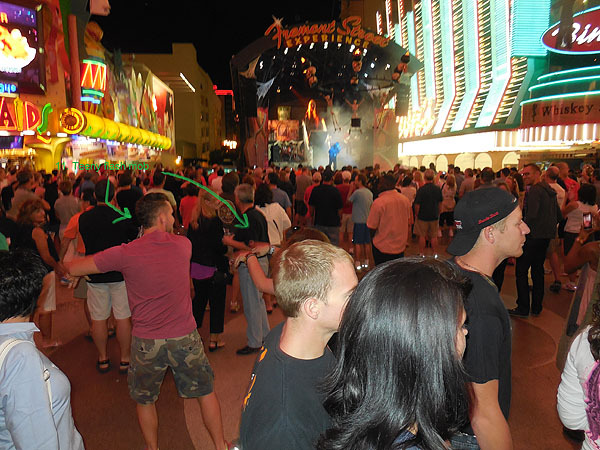 A team picture with some of the pit dancers at any of the casinos. 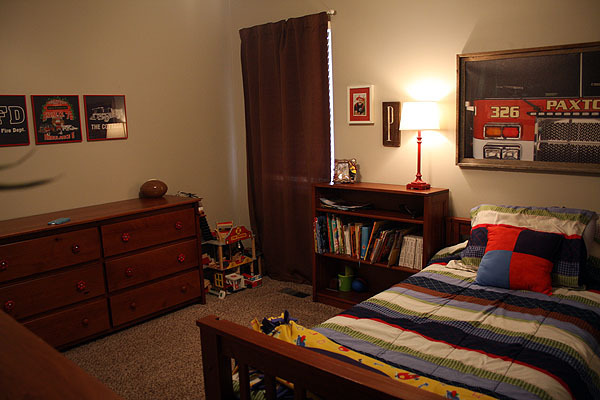 A couple of weeks ago, we scored a great deal on a set of used bedroom furniture for Paxton's room. 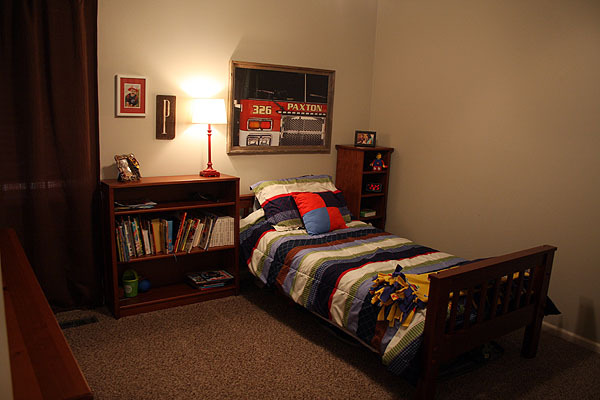 His room had been a hodge podge of hand-me-down and Craigslist furniture, so this set was a very nice upgrade. 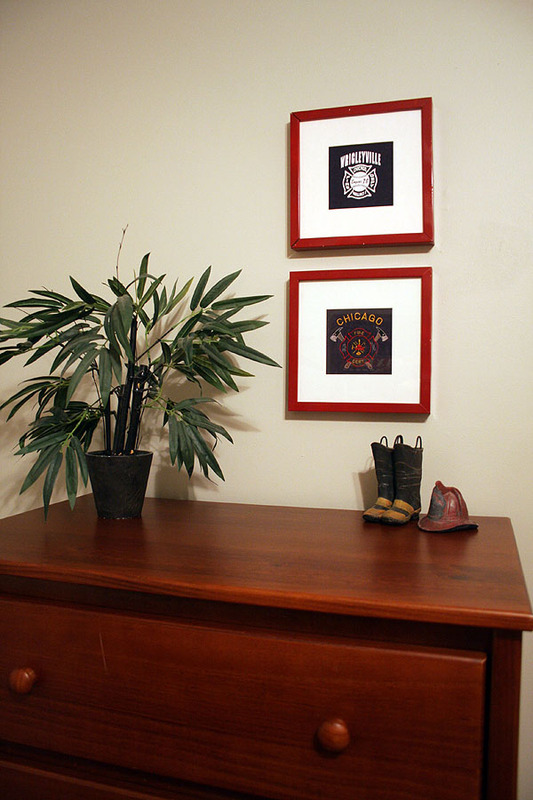 I finally got around to hanging all his fire department-themed artwork last week and thought I'd share the "finished" photos. Last summer we stopped in Paxton, IL to see the fire station with Paxton's name all over it on our way home from Chicago. 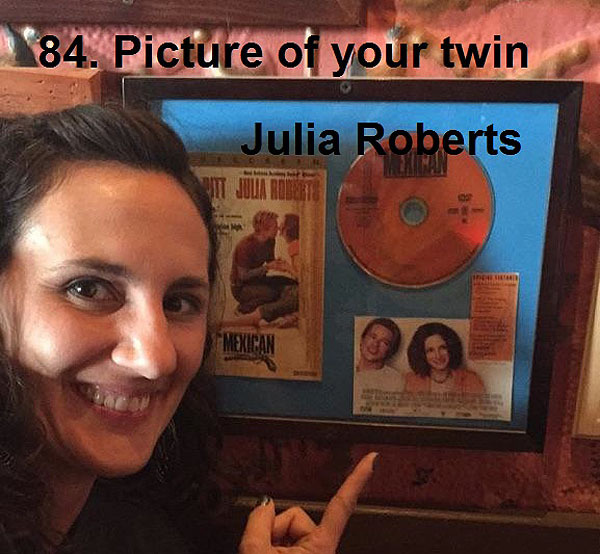 While we were there, I took that photo hanging over his bed. Believe it or not, the photo was taken through the glass of the fire station garage with my phone's camera! 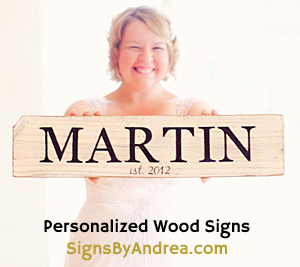 I had it printed at Zazzle as a 36" x 24" premium gloss canvas poster print, spray-mounted it to a cardboard backing and framed it in an open-backed barnwood frame that I bought on Etsy. 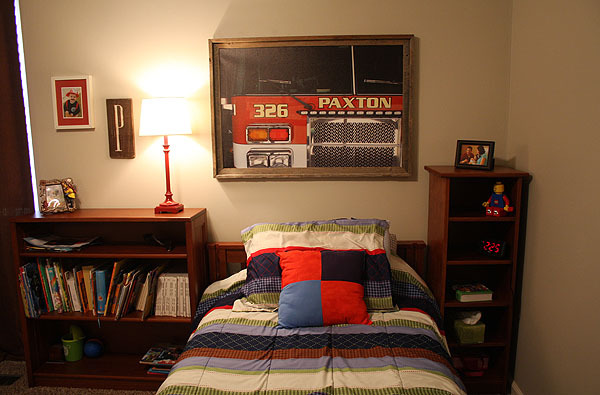 My dad (a retired Chief from the Chicago Fire Department) has provided us with TONS of CFD t-shirts over the years, so I used several of them in the artwork for Paxton's room. 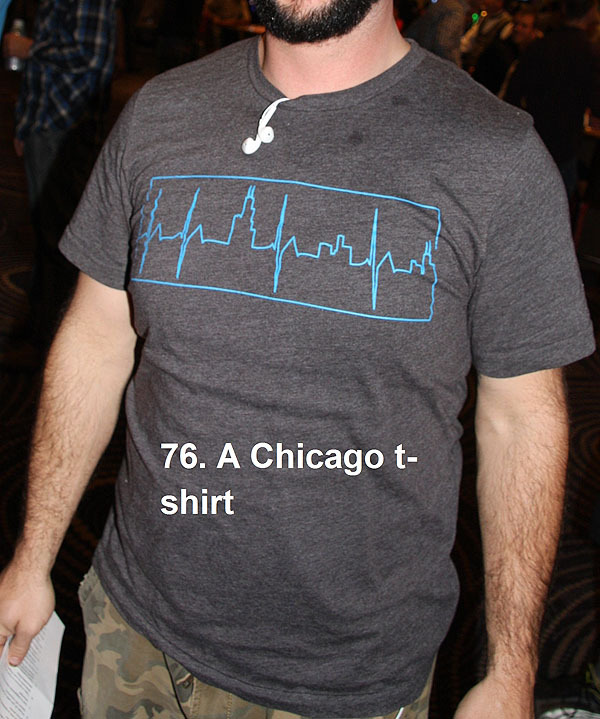 Instructions for how I framed them are provided here in my Framed T-Shirt Art Tutorial. The frames are all spraypainted red. 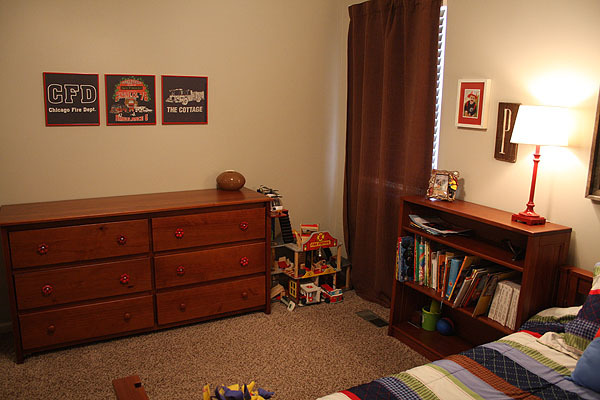 Several of the drawer pulls on his large dresser were not staying on very well, and the baseball & football pulls that the seller had used in her son's room didn't really go well with Paxton's room. 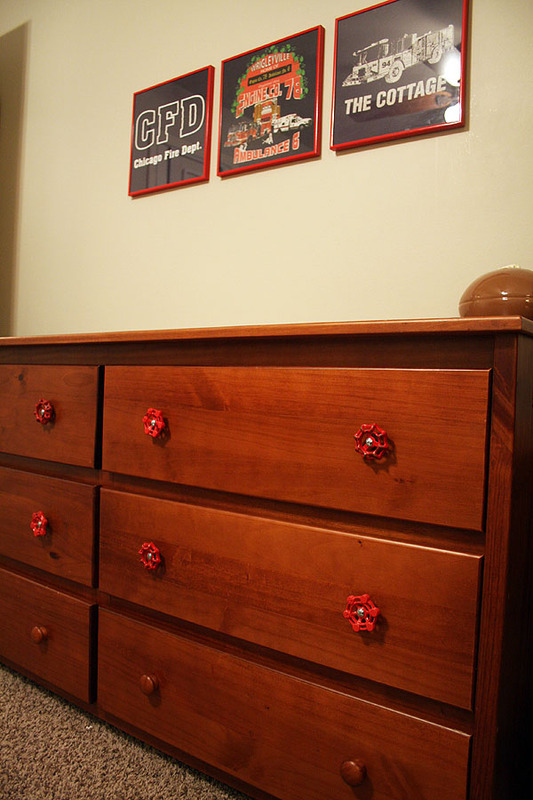 I've been eyeing some vintage water valve handles for years as an accent in his Fire Department bedroom, so this seemed like the perfect opportunity to buy them! 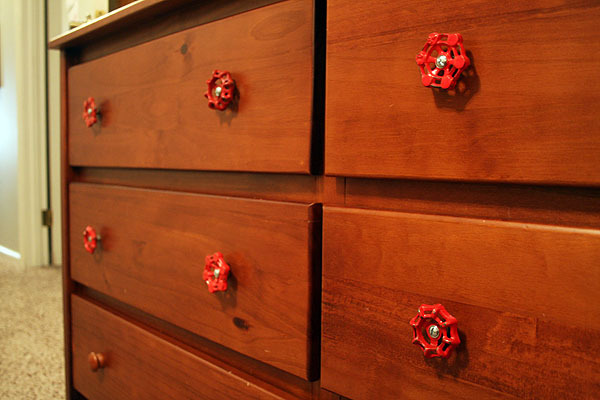 I found two sets of 4 red handles on Etsy from a store called palacecastaway. 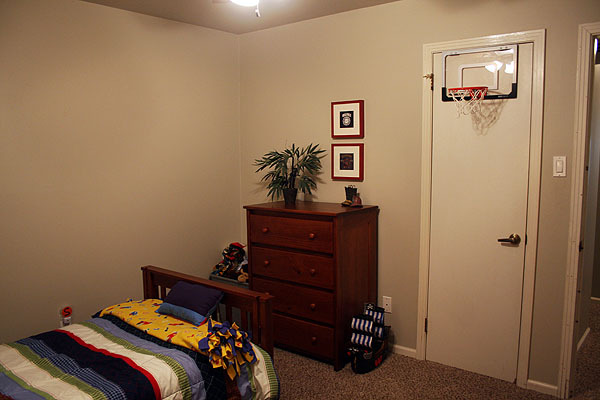 So that's it, Paxton's new room. His reaction? 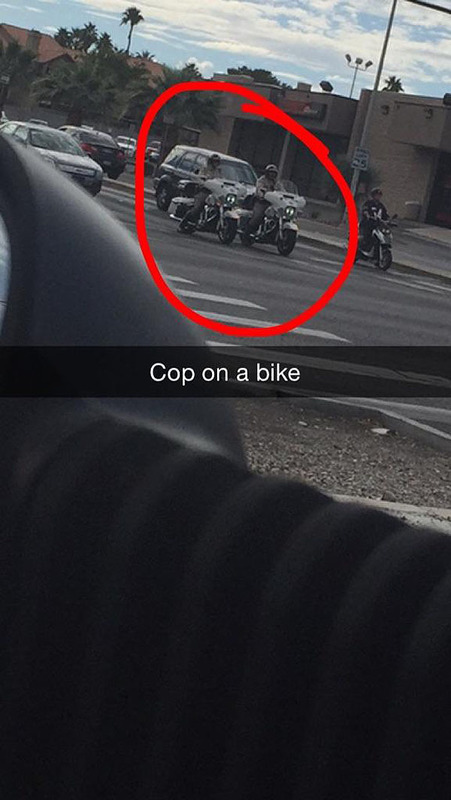 He gave me an appreciative nod and a "This is pretty impressive!" comment. 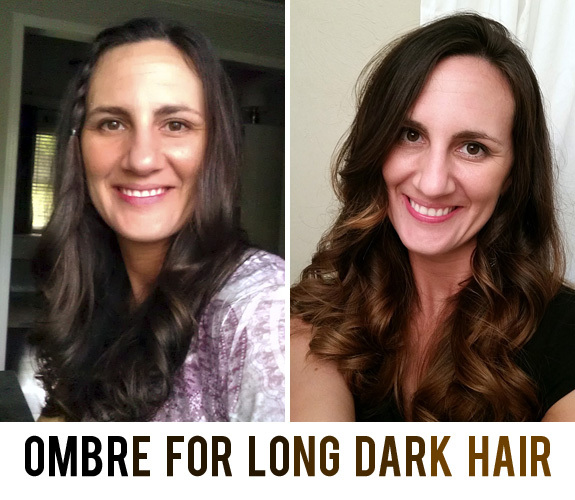 When your hair is as long and as curly as mine is, you tend to look for a hairstyle that looks decent, tames the mane, and most importantly is FAST and EASY. 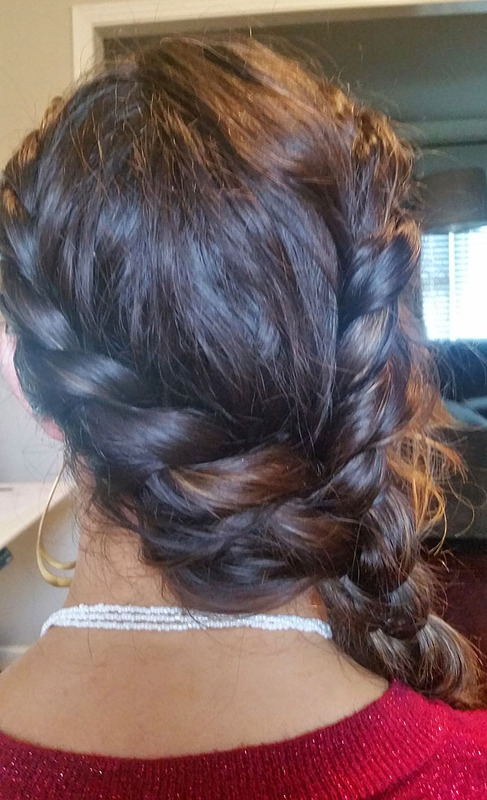 A plain ponytail just looks messy on me, so this Rope Braid (I also call it my "Katniss Braid"--but it's not exactly like hers) has become my go-to hairstyle on days when I don't have time to mess with wearing (and fixing) my hair down. 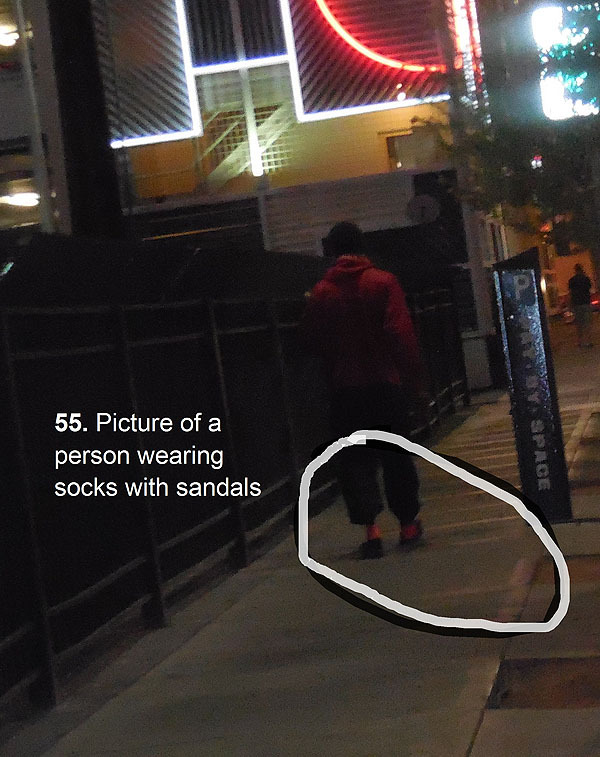 People ask me how to do this ALL. THE. TIME. 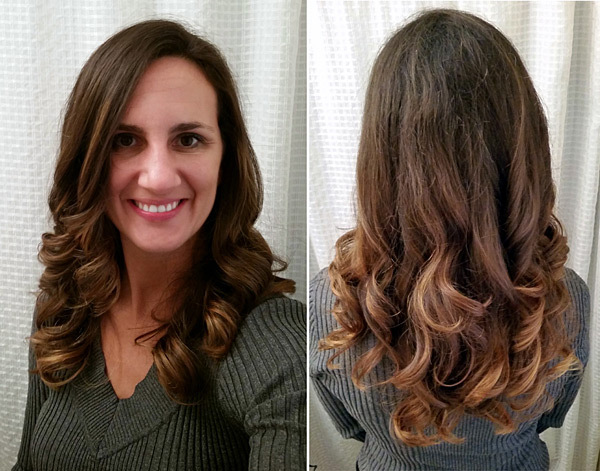 It literally takes less than 2 minutes--and you don't even have to have clean hair or even brush it! Sometimes I even put it up like this straight from the shower while my hair is still wet. Pretty, right? Looks complicated...but it's really not. Part your hair to one side and separate out a small bit of bangs (if you want) on the deeper side of the part. Start your twist on the narrow side of the part and section out two small pieces from the top, around your face. Twist the lower piece (B) over the upper piece (A), letting the top piece (A) come down. Add another small section from the front of your hair to the piece that was twisted around (A). Then twist that piece (A) over piece (B). 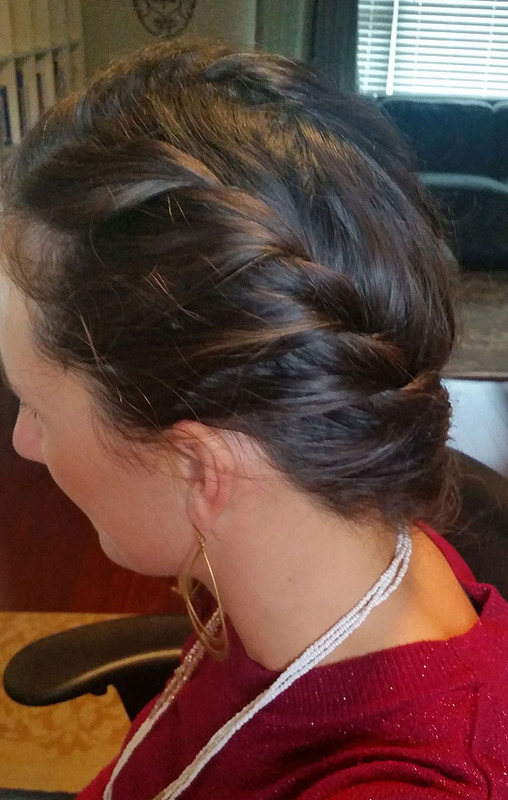 Add another section of hair to piece (B) and twist again. Continue all the way around your head until you reach the other side of your neck. 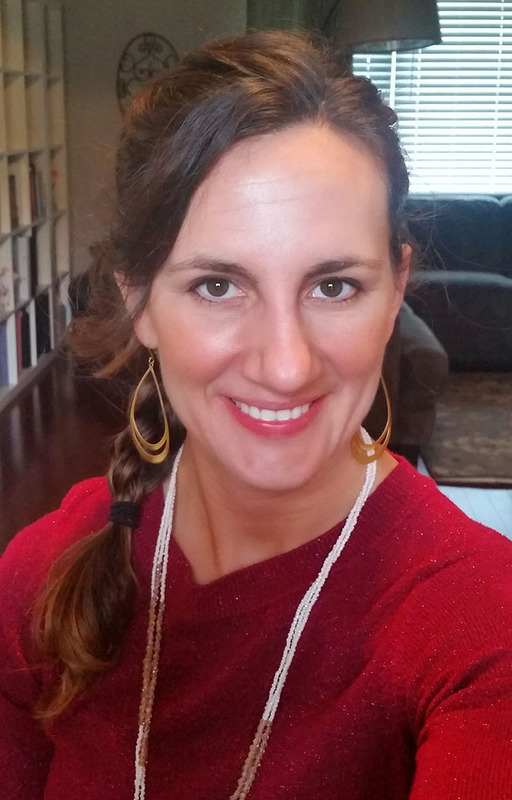 Leaving the bangs out, begin again on the other side of your head, twisting the lower section over the upper section until you reach the bottom of your neck. At this point, you will have three pieces sectioned. The original twist from the narrow side of your part, and the two pieces you have been twisting from the deep side of your part. 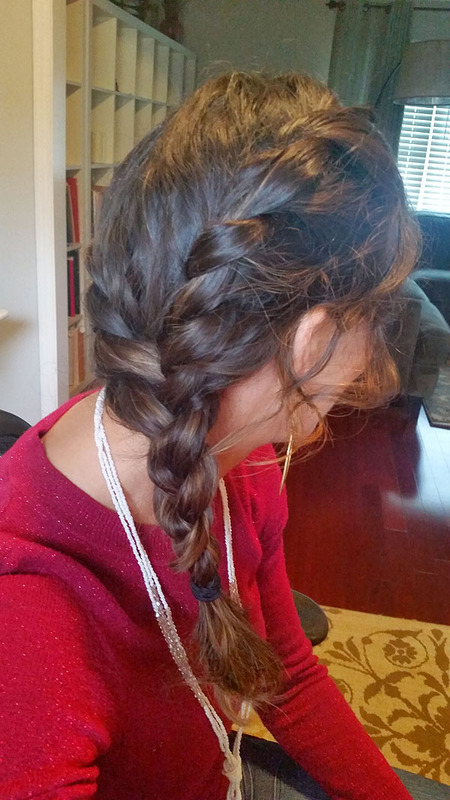 Braid them with a normal 3-strand braid to finish it off. 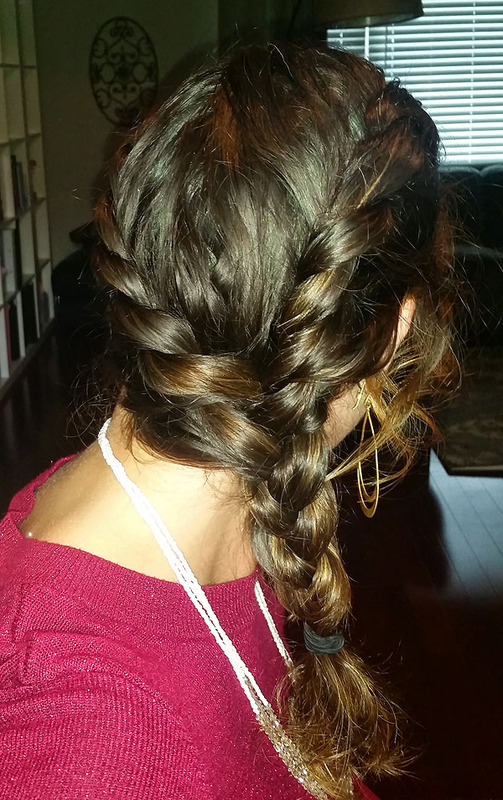 If the three sections are uneven, you can re-section them with your fingers before you start the braid. 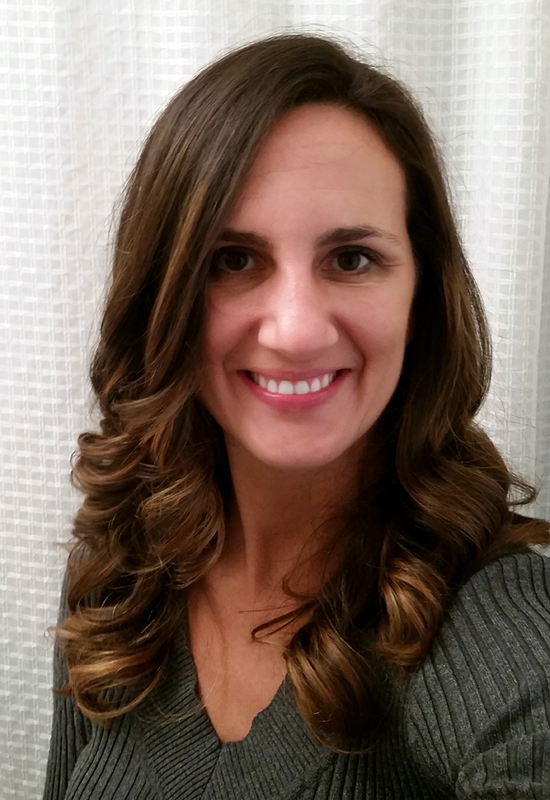 I like to curl my bangs back with a large-barrel curling iron to finish off the look. 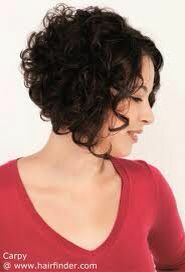 This style is great for layered hair, since it pulls in the layers as you twist around your face. If your hair is shorter, you can just put it into a ponytail at the bottom instead of continuing a braid down your shoulder. Natalia at MaNouvelleMode has a great tutorial on how to do a version of this as well as well as tons of other great hair tutorials! Check hers out too! 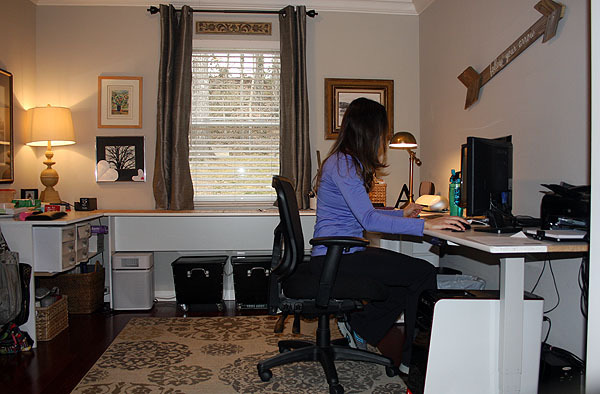 Since August 2014 (about 6 months from when this review was written), I've really enjoyed the versatility of a seated or standing desktop in my home office via an Uplift 900 Adjustable Desk, so I thought I'd write a quick review. Why should you have an adjustable desk? 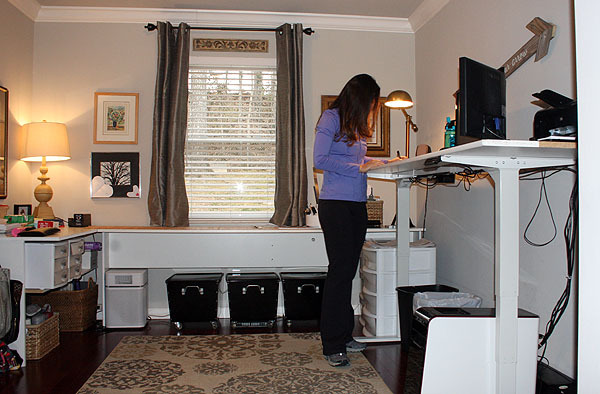 For the past year, my husband Ben has benefited from having an adjustable Geek Desk in his home office which allows him to adjust his posture, switching from seated to standing positions throughout the day to help relieve a chronic back injury. When I also started suffering from some pain in my right shoulder and both of my hips, I decided it was time to give MY office an overhaul and figure out a way to incorporate both standing and sitting while I work. What are the options for an adjustable desk? Like Ben, I work from home, but my office happens to be adjacent to the living room and kitchen areas of our house -- a VERY high visibility area of our home. So, in addition to wanting an adjustable-height workspace, I also still wanted it to look like part of our house--not like typical office furniture. 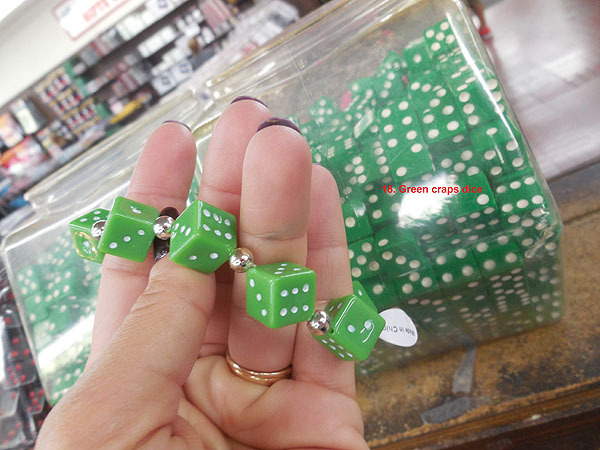 So I went shopping, and found several viable options. 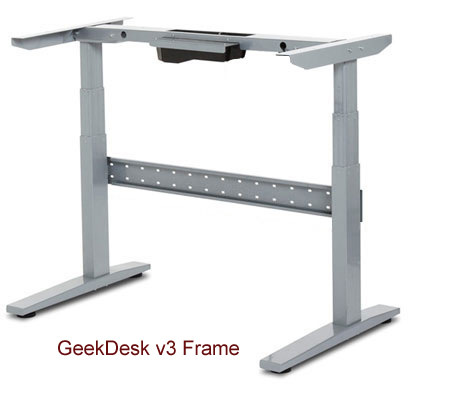 The Geek Desk was pretty pricey at $525 for the smaller frame and didn't quite accomodate the length of workspace that I needed in my office. 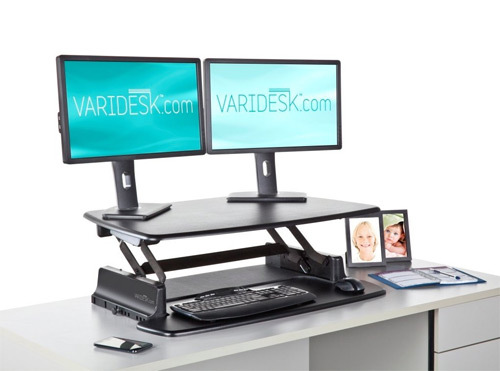 I also considered a VariDesk, which sits on top of your desktop, and is significantly cheaper at about $300, but then only my computer space would be adjustable, which didn't give me an adjustable painting workspace, so it wasn't practical for my purposes. 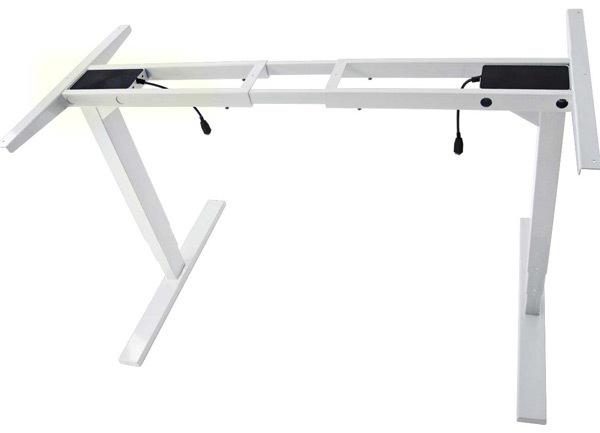 Amazon also carries several additional variations of adjustable or standing desks worth looking at if you're shopping for something similar, like the Jarvis Electric, MultiTable Mod Table, or the Ergotron WorkFit-D. Reasonably Priced - The Uplift 900 landed right in the middle of the high and low-end options at $499 (in August 2014) with free shipping. Accomodates Wide Width Desktops - It was important that I have lots of adjustable workspace for both my computer and my painting workspace. The Uplift 900 expands with enough support to accommodate my existing 96" x 23.5" white melamine desktop. Streamlined Look - Asthetically, I liked that it has a t-bar style of support and didn't have the large visible metal support bar underneath the frame like my husband's Geek Desk has. Since my office and desk is more visible to the rest of our home, I wanted it to blend as much as possible. Great Customer Support and Information - I was very impressed with The Human Solution's thorough video demonstrations of how the desk works, how much weight it can hold, and even exactly how to assemble it. Was it hard to put together? It's extremely heavy, but it's so easy to assemble, thanks to the video assembly instructions. I needed help turning the desk over once it was assembled, but otherwise was able to do the entire assembly on my own. 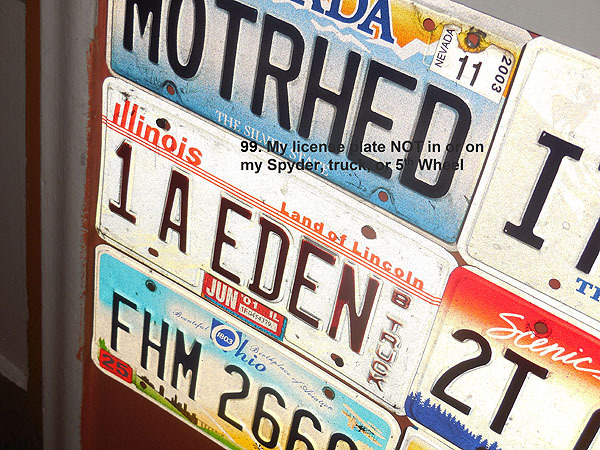 Here's a look at the underside of my desk. 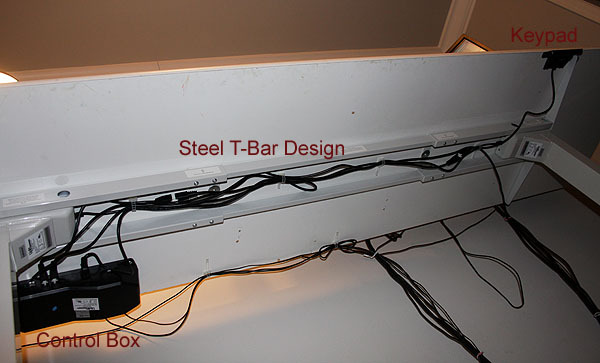 You can see how the support beam down the center is extended between the legs of the desk, as well as where the power supply control box and keypad are attached to the desktop. 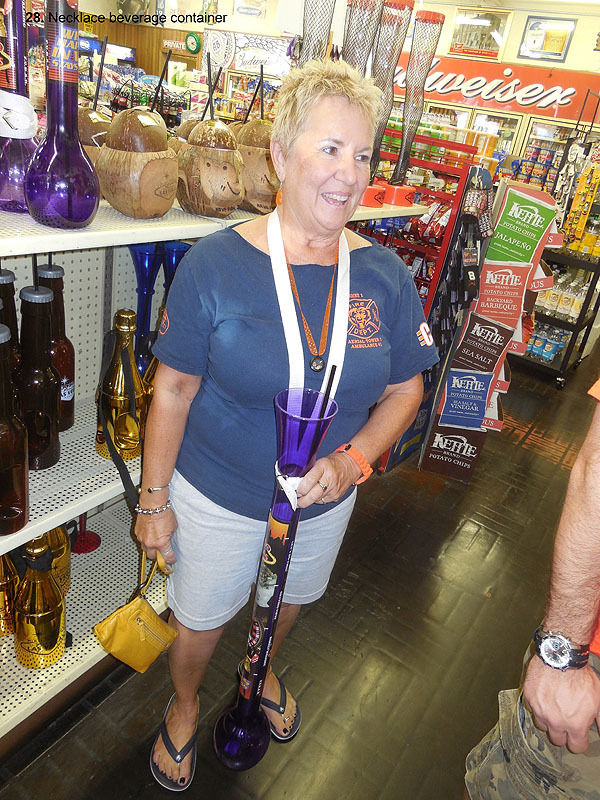 Is it loud, or cumbersome to change heights? How much do you really use it? I probably stand about 5 to 6 hours of each day and sit 3 to 4 hours of the day, but it depends a bit on what I'm working on, and how I'm feeling. I LOVE that it's not just one option or the other, and in fact, sometimes I adjust the height by just an inch or two to relieve shoulder pain or eye strain if I happen to be doing more typing or browsing, etc. Anything else I should consider before I buy? I wish the keypad had a lock feature. 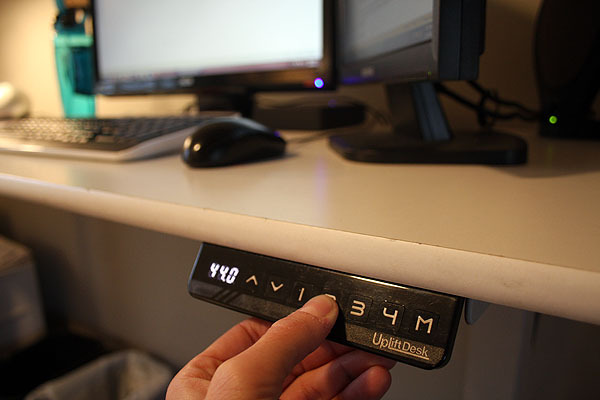 If you have kids (which I do), there's nothing stopping them from pressing those buttons and changing your desk height. My kids know they are NOT allowed to touch, but I bought the desk when they were old enough to understand (and obey) that. 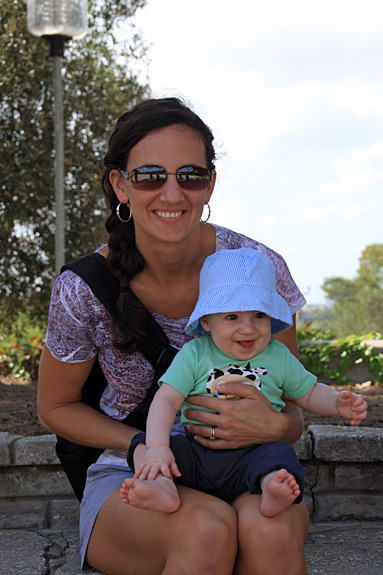 A 2-year old could certainly not resist! The more weight you put on top of the desk, the slower it will transition, since the motor has to work harder. 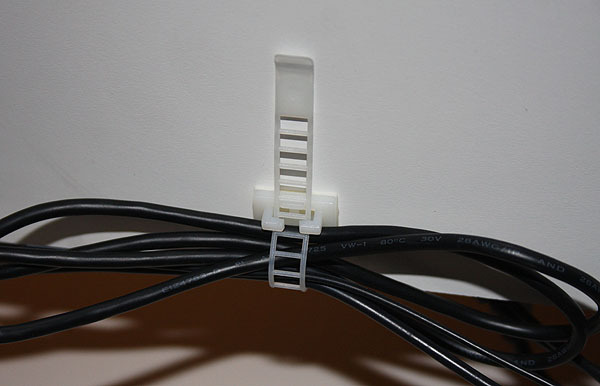 That's one of the reasons I opted NOT to buy the CPU case that would move with the desk as it adjusts -- though honestly, I don't think it would have been a problem. This sucker is STURDY! Emphatically, yes! Overall, I have been 100% pleased with my decision. I would NEVER go back to a sole-ly sitting desk again. The relief I've had in my shoulder and hips has been worth every penny. Plus, I enjoy not having to be so sedentary on long work days. If you have any questions about how the Uplift 900 works, my experience with buying from The Human Solution (which was great), or anything else related, be sure to comment below and I'll do my best to answer! 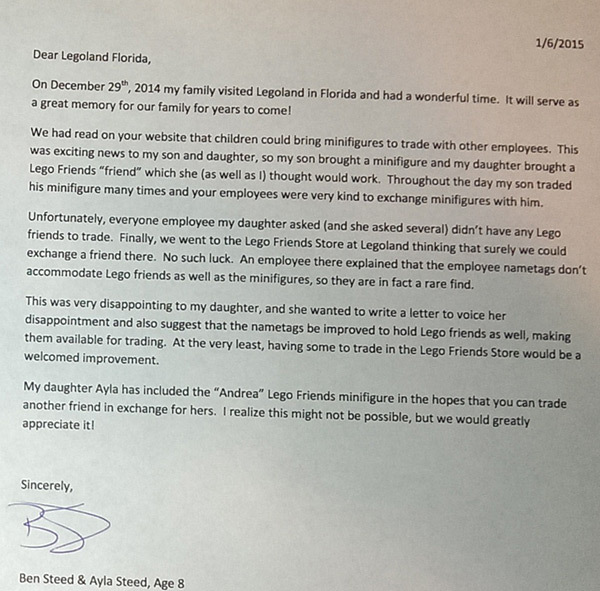 After our very fun trip to LEGOLand Florida over Christmas break, Ayla and Ben decided to write a letter to LEGOland to bring to their attention the ONLY disappointing part of our day -- There wasn't much LEGO Friends representation at the park other than a single shop, and LEGO Friends are Ayla's favorite kinds of LEGO. 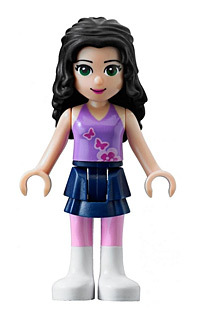 Her main frustration was that she wasn't able to trade a LEGO Friends minifigure with any of the employees like Paxton was able to do, because the nametags that the employees wear to hold their minifigures aren't able to hold the Lego Friends characters because of the way the Friends are designed. 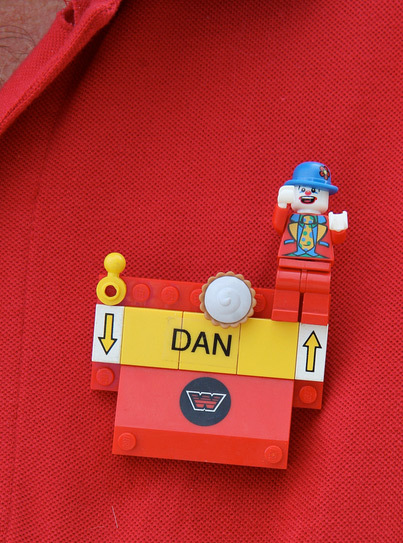 The regular minifigures attached to the front of the nametag, rather than the top, which is how the LEGO Friends characters would have to attach. 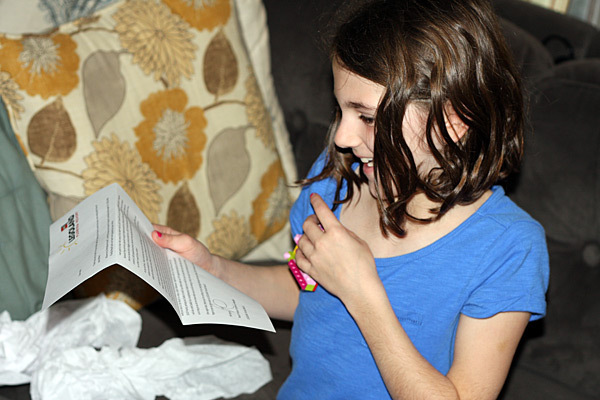 So, Ayla and Ben sent a letter. Ben explained to her about how instead of just sending a complaint, it would be more helpful to LEGOLand and all the other girls who like LEGO Friends if she offered a solution to the problem. 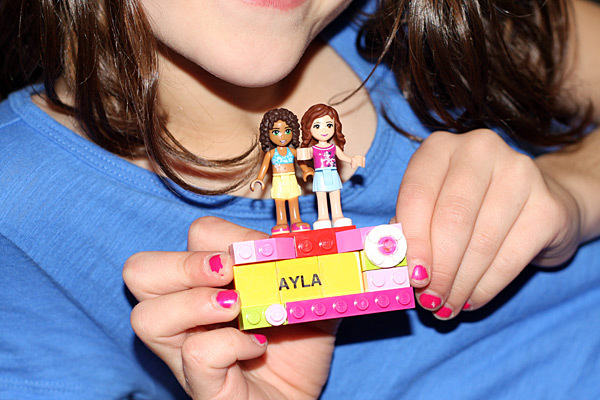 In her letter, Ayla suggested they modify the nametags to accomodate the LEGO Friends characters as well. 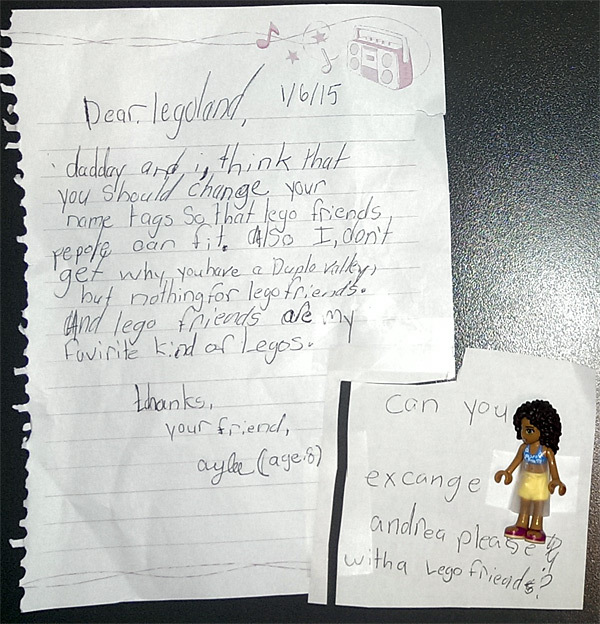 She also sent one of her own LEGO Friends characters with her letter in the hopes that they might offer her a trade after all, since she wasn't able to do it at the park. It never hurts to ask--and she understood that she might not ever get a response, but she wanted to try. 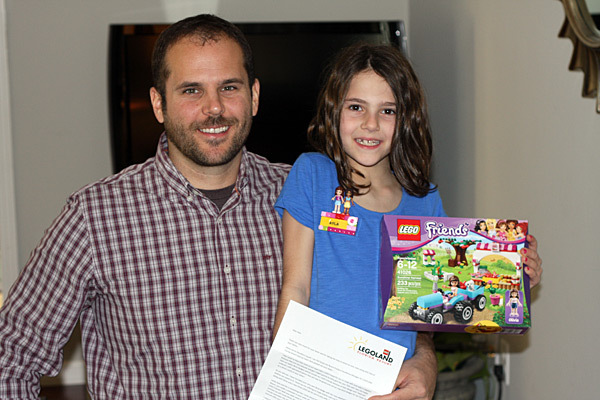 Today, we received a package in the mail from the LEGOLand team in response to her letter. That's a pretty big package for a letter!!! 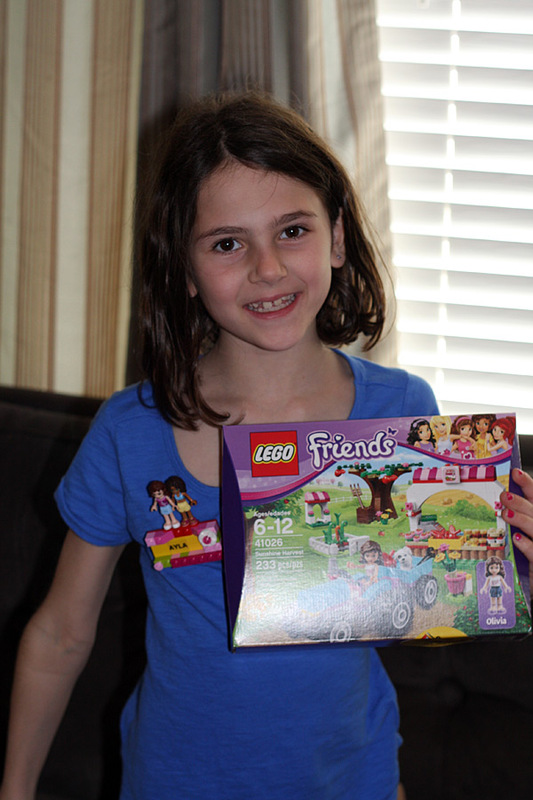 In addition to a personally written letter thanking Ayla for her suggestions, she received the "Andrea" Lego Friend character she had sent them AND an "Olivia" one to join her, a new LEGO Friends LEGO set to build, AND her very own LEGOLand Nametag! 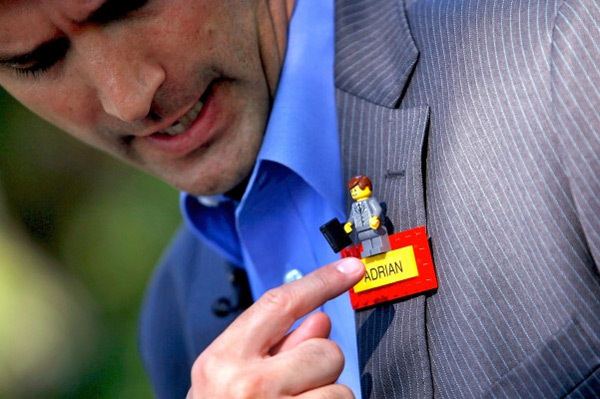 Notice how her nametag holds the LEGO Friends' characters? 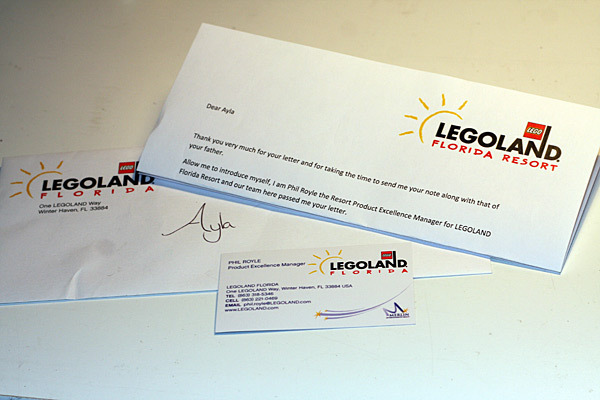 It turns out, as a DIRECT result of Ayla's letter, they ordered 1500 pieces to modify the LEGOLand employees nametags so that from here forward, they'd be able to offer LEGO Friends characters in their minifigure trades! 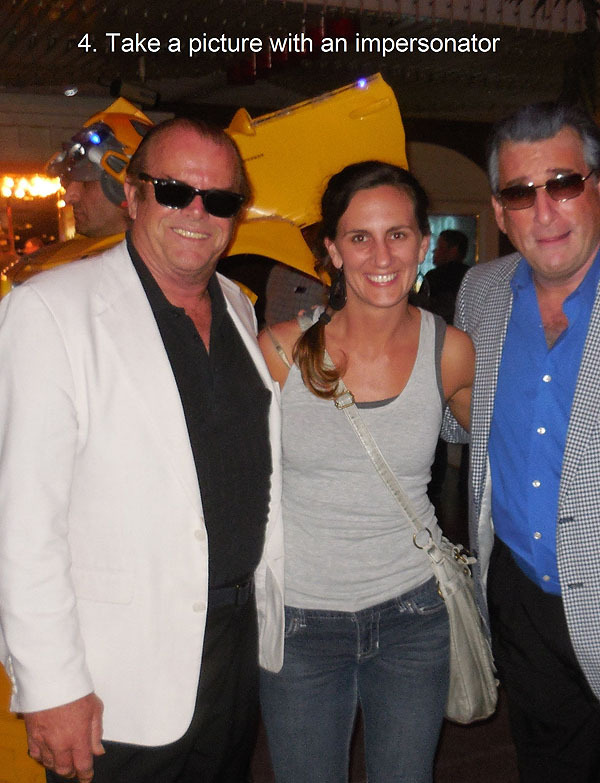 Even better, they told her they are in the process of building a brand new area at LEGOLand called Heartlake City, opening this summer and offered Ayla a VIP experience at the Heartlake Salon and an opportunity to meet Emma (one of the Friends). All that AND 4 tickets for our family to spend another day at LEGOland! Wow. I guess we'll be going back! Thank you LEGOLand! You certainly made her day! It's official! 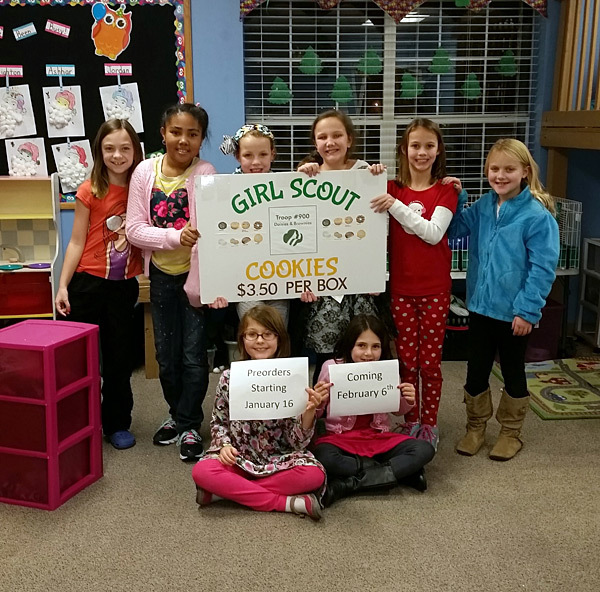 The Girl Scout cookie selling season has begun. Ayla really enjoyed selling last year (we walked the neighborhood with a wagon) and is very excited about doing it again this year. It's a good opportunity for her to practice talking to adults, answering their questions and counting money and making change. I try *very* hard to let her do the talking! 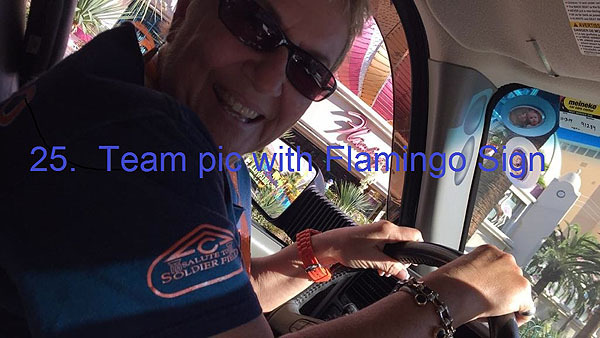 Which isn't too hard since we walk up and down about 100 VERY hilly driveways to do it! 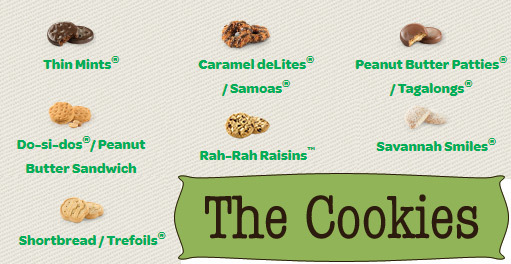 So...until we collect cases and cases of cookie boxes and hit the streets of our neighborhood, she is taking pre-orders and will be able to begin delivering your cookies to you on February 7th. 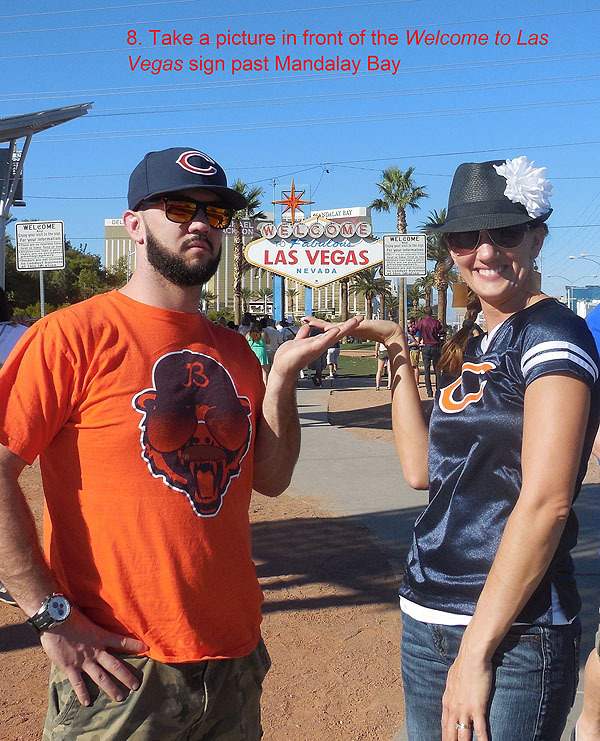 Unfortunately, our area is not offering the "buy online & have your cookies shipped" option (maybe next year? ), but if our Chicago family & friends would like to order any boxes, we will be in town at the end of March and can bring them to you then! 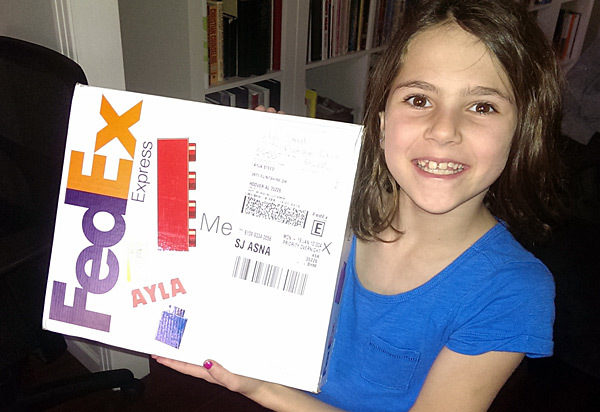 Thank you for supporting Ayla and her troop! I've caught the bug. 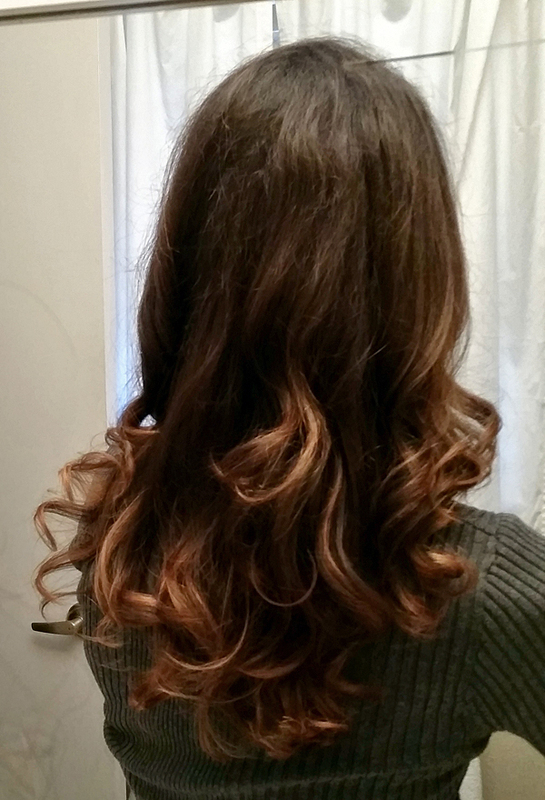 After my first hair-coloring experience earlier this year, it was finally time for a touch-up. 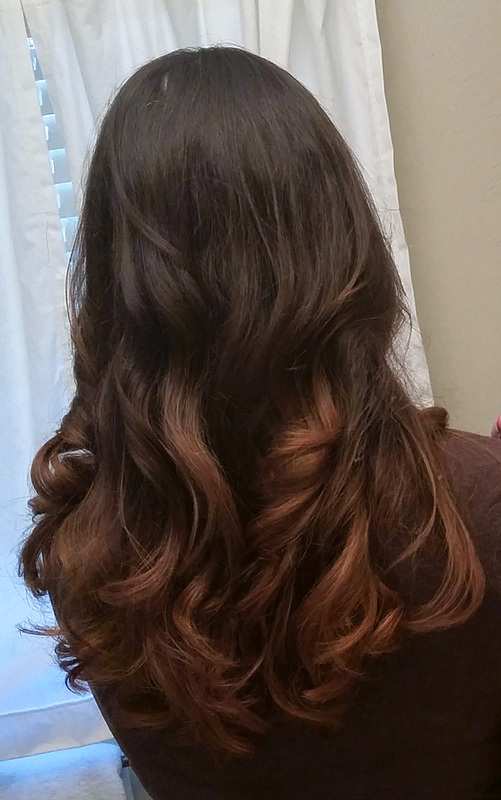 Last time, I went with an ombre technique, blending my dark hair into a lighter, caramel color. This time though, I wanted to keep some of my darker hair and have a little more contrast throughout, so I asked for a highlighted look instead. 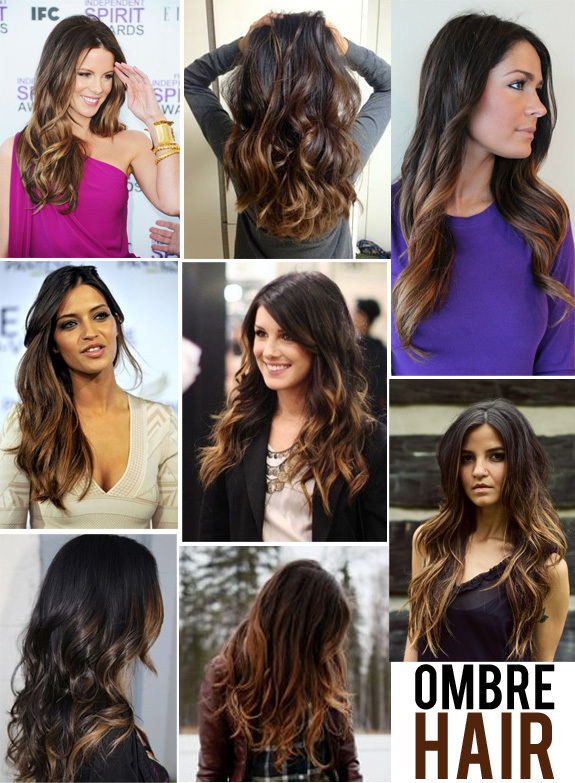 While I was looking for ideas, I came across a trend called "Balayage" - which is a technique of painting strands of hair to create a more natural, sun-kissed look. 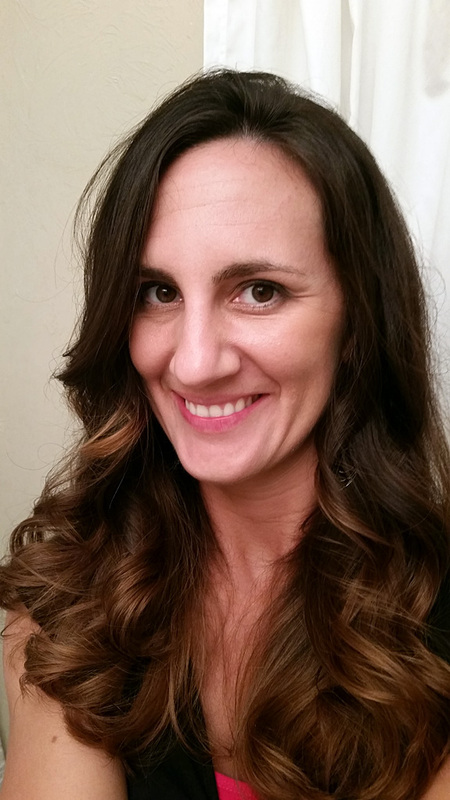 I asked my stylist to make me look like Lily Aldridge or Kate Beckinsale. :) She did her best with what she had to work with! I'm happy! It's always fun to look a little different for a change. Finding the right color meant everything to me in my scrapbooking days (how many hours did I spend searching for the perfect shade of Bazzill cardstock?). I think about it every time I get dressed in the morning and look for the right shoes and earrings for an outfit. And it definitely holds true as I've been sloooowwwly decorating each room in our house. No matter what the canvas - the right color scheme pulls everything together. 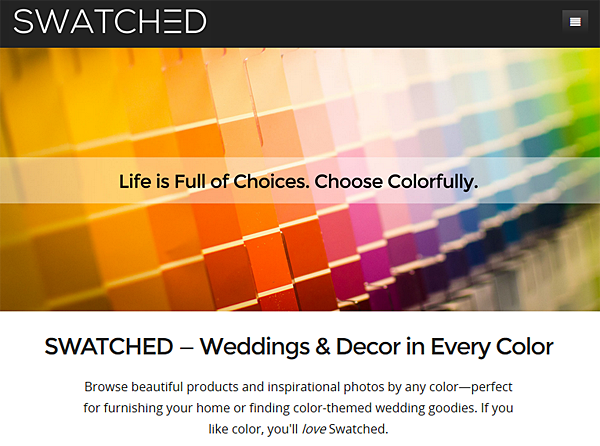 When Ben told me about his idea to build a website that lets you browse thousands of inspiring images by color (in my case, I was smitten with the home decor-related photographs and products), my eyes got wide and my head started spinning. Ooooh! 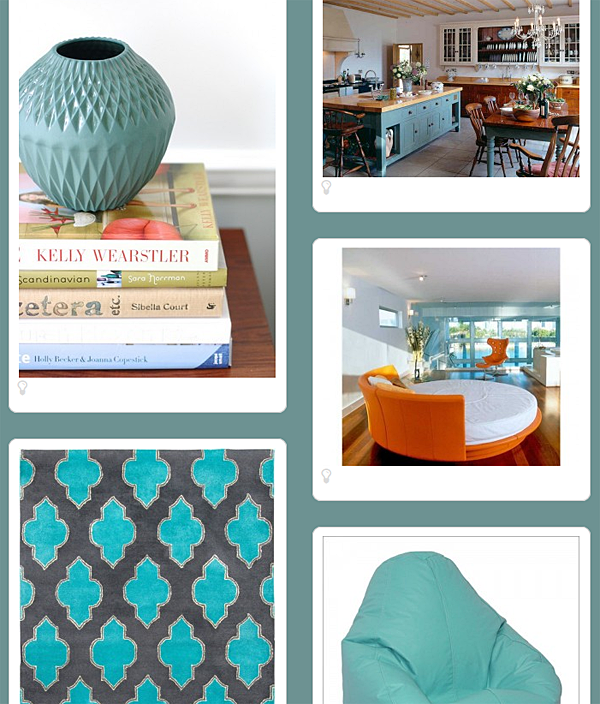 If I could look through a ton of photos that used MY colors, it would be so much easier to get ideas for what to buy and how to curate a room that actually looks good! I've been organizing by color for years...buttons, stickers, clothing, markers, papers...you name it! To see a rainbow of photos and products presented like this just gets me giddy. 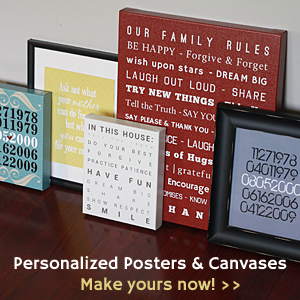 It's fun to look at, gets my creative juices flowing, and gets me excited about decorating. 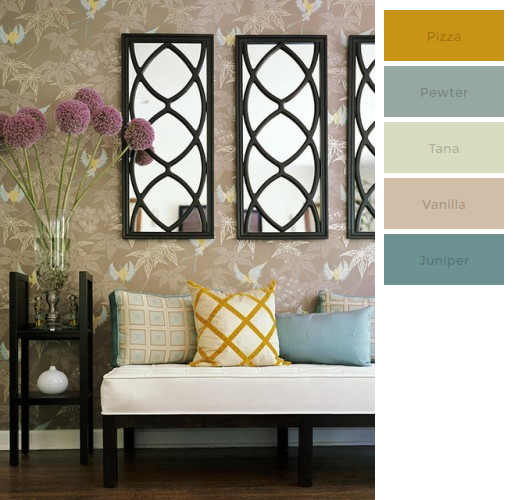 Here's an example of how I've used Swatched to browse and shop for ideas in our home. There it is! The perfect use of my colors, in a style I love. Amazing! Swatched is brand new and still growing! Like it on Facebook to find out about new feature rollouts and follow Swatched on Pinterest for daily pins in your favorite colors. Below I've written down 5 weeks worth of workouts I've done, just to have a variety to reference if I am ever stumped for a workout to do. I thought I'd share it here in case anyone else wanted to try them. Disclaimer: I am not a trainer. I have no idea if this is an efficient or "right" way to exercise. It's just what I like to do. Also, this was not a weight-loss goal (my weight stayed the same)--it's just a sampling of my regular strength and cardio maintenance routine. If I was trying to lose weight, I'd have to stop eating so many Cheese-Its! I generally exercise 4-5 days a week, usually between 20 minutes to 50 minutes long--sometimes at home, sometimes at the gym. Lately, I tend toward a mix of running, HIIT (high intensity interval training) workouts, and yoga. Most of my workouts don't require any equipment, but occasionally I do use an interval timer app on my phone, an exercise mat, a kettlebell (20lb), dumbbell (5lb), or a chair. 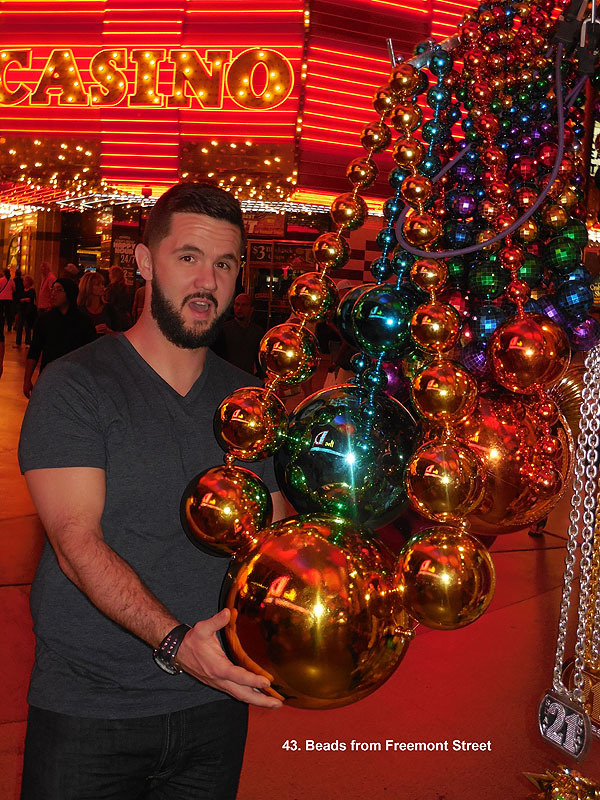 If I've used someone else's workout routine that I found on a blog, DVD, etc., I've linked to their website or YouTube channel, so you can follow along with them. 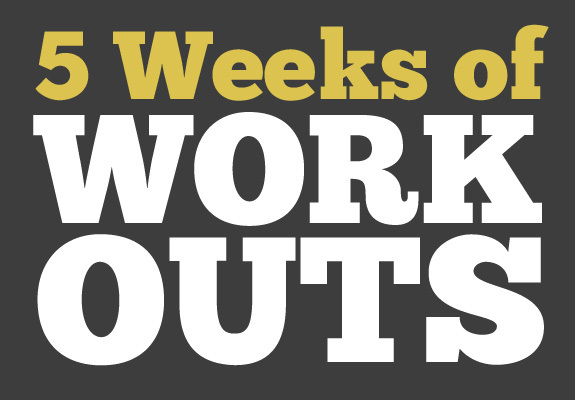 There are some great real-time workouts out there! This was more of a strength yoga exercise, mostly on the floor, plank taps, core exercises, not much in the way of warrior, lunges, balance, etc. This was a very good hip flexor stretching routine...good after a run! I've never colored my hair....until yesterday. 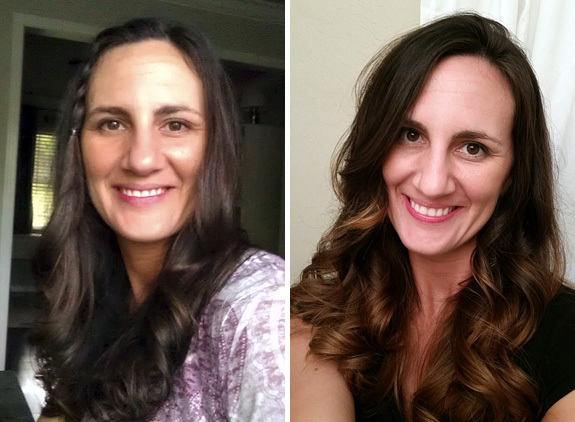 Since it takes me about 6 months to a year just to get back to the salon to get my hair cut, regular color maintenance is all kinds of inconvenient for me. I was nervous, but excited when I went in to color my hair for the first time. I know for many people, this is just an old-hat no-big-deal sort of thing, but for my first time--it was kind of a big deal. I had NO idea how long the process takes. I was at the salon for just over 3 hours, and my neck got tired from holding up all that foil! I'm interested to see how the color gradient looks in my signature braid, or with natural curls.